Another couple of non-standard ways of creating Koch Snowflake outlines. These two approaches use a ring of six corner-touching hexagons, with or without an additional seventh central copy. 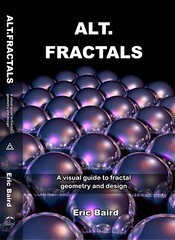 There's an example of the first version appearing as a fractal solid's silhouette in figure 9.5 of the book (as the tiny lower-right image). The book also has face-aligned hexagon-based Koch Snowflakes in figures 3-13 and 7-5. Note that every smaller detail is also a Koch Snowflake, and every little remaining space between the snowflakes also progressively gets nibbled away to form yet more Koch snowflakes as you apply more iterations. The more conventional Koch Snowflake approach gives a self-similar fractal outline, but its components are triangles. In these two cases, we go one step better – we generate the same fractal outline as before, but now the whole thing is fractal, including the interior. 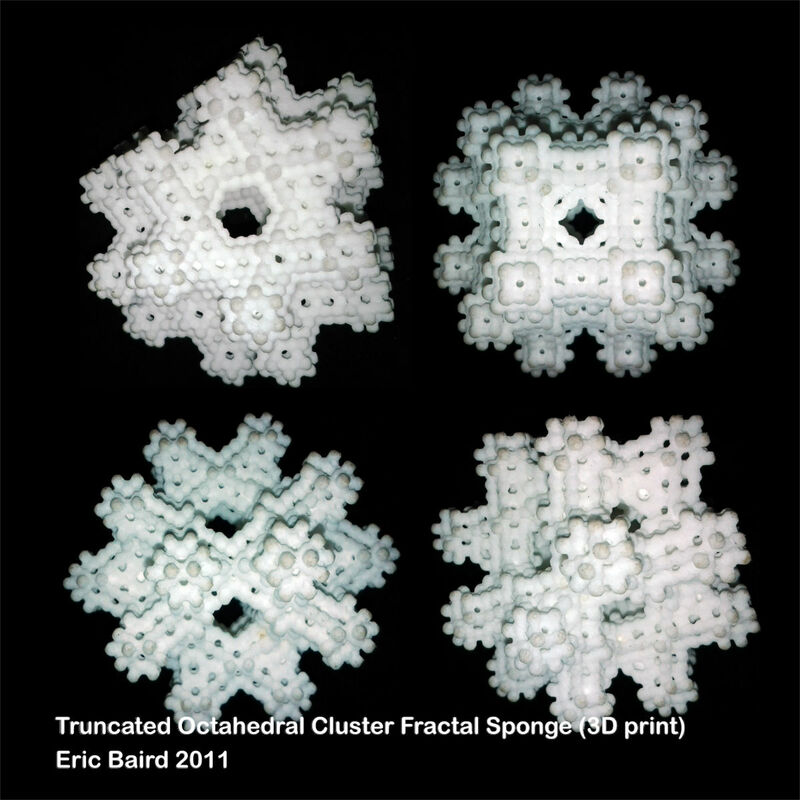 In theory, it's a Koch Snowflake built from nothing but other Koch Snowflakes. The shape becomes its own building-block, and its own template ... no fundamental shape exists in its self-contained geometrical universe but itself. For more examples of Koch Curve tilings, see figures 30.4 and 31.2 in the book. 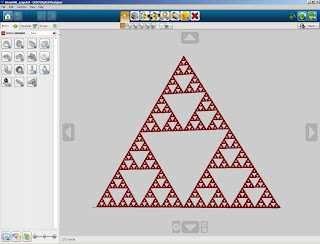 The Sierpinki Triangle, rendered in Lego. The basic building-unit used here (to get proportions that look like an equilateral triangle) consists of four bricks: a 1×1×4 base strip, two 1×2×1 slanted roof pieces and a 1×1×2 top strip. This model has 64 of these units per side. In theory, it should take 4*3^6 = 2,916 bricks to build it, but in practice, if you were building a real one and having it standing vertical, you'd want to replace a lot of the little adjacent base strips with longer strips for reinforcement, and maybe also stagger them for extra strength (which is why Digital Designer's showing a reduced brick-count in the screenshot that's closer to ~2700). 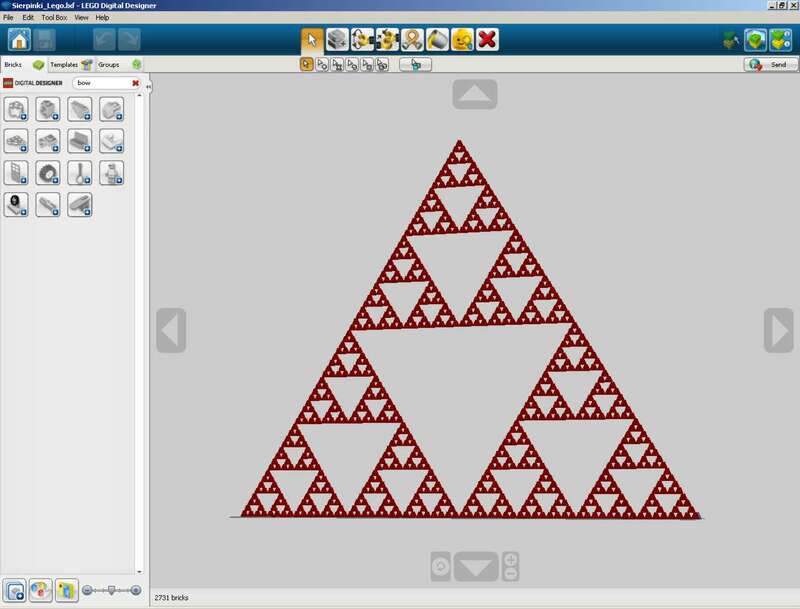 A "World's Biggest Lego Sierpinski Triangle" competition might be entertaining. You can imagine kids building little sections of these at educational fairs, and then getting to watch them being assembled into bigger and bigger versions. Fun. A plastic 3D print of a tetradecahedral fractal cluster sponge, based on Figure 9.9 of the book (it's on on page 66). The two diagrams in Figure 9.9 of the book weren't actually 3D modelled – they were "faked" 2D diagrams done in CorelDraw thanks to some clever shading (and a lot of coffee) – but I figured that a real 3D model shouldn't be too difficult. The basic shape is a truncated octahedron: a semi-regular 14-sided polygon with six square and eight hexagonal faces. It's the shape that you get either by cutting the points off an octahedron to turn its triangular faces into squares, or by cutting the corners off a cube, but really deeply so that instead of getting new triangular facets the new faces intersect and end up as hexagons. 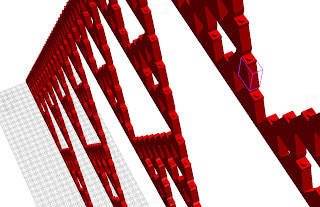 Anyway, you can fit a smaller copy of the solid into each of its corners, and then use a network of adjacent sibling copies to link them together using only face-to-face connections, and once you've replaced the solid with a skeleton of little copies, you can then repeat the process inside each of those little copies, and repeat. The end-result looks a little like the sort of polyhedrally-based patterns that you find in the microscopic skeletons of radiolarians.